Happy Anniversary to…a Crazy Man. One year ago today I began the craziest thing I’ve ever done. At about 10:30 in the morning I began riding my bike, and by “bike” I mean bicycle, from Phoenix, Arizona, to Denver, Colorado; a trip of 800 miles. Looking back on it now, I’m amazed that I made it; not to mention that I even tried. My motivation at the time was simple; to return home to Colorado, where I had previously lived for 18 years. My mode of transport for the trip however, was unique. I carried everything I thought I would need for at least two weeks on the road on the bike with me. Clothing, a tent, a sleeping bag and pad, as well as surprisingly few other supplies, were all strapped to the bike. 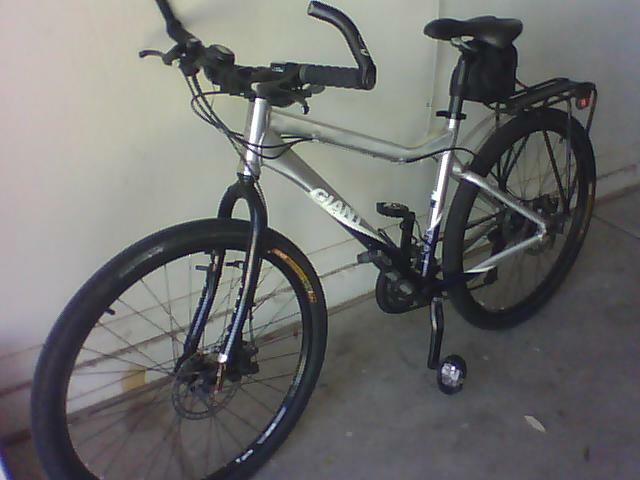 The bike itself, a mountain bike I’d hybridized into a commuter, was certainly not designed for such a ride. But, it was what I had. My first day on the road began well enough. The Phoenix metro area is relatively flat, after all. But soon after leaving town things became more challenging. First, I fell, scraping my left knee and breaking my rear-view mirror. I’d rarely used a mirror in town, but I thought it would be smart to have one for such a long ride. Well, that was the idea, anyway. So, bloodied and brooding, I continued. Then I began to hit some climbs. Those nearly finished me almost before I began. Phoenix is called the Valley of the Sun, due to the fact it is surrounded by mountains. While these mountains are not large by Colorado standards, they’re pretty big to a cyclist. Especially one carrying about 60-70 pounds of extra stuff on his bike. I did a few miles of walking that first day, pushing the bike uphill, which was something I would do repeatedly during The Ride. 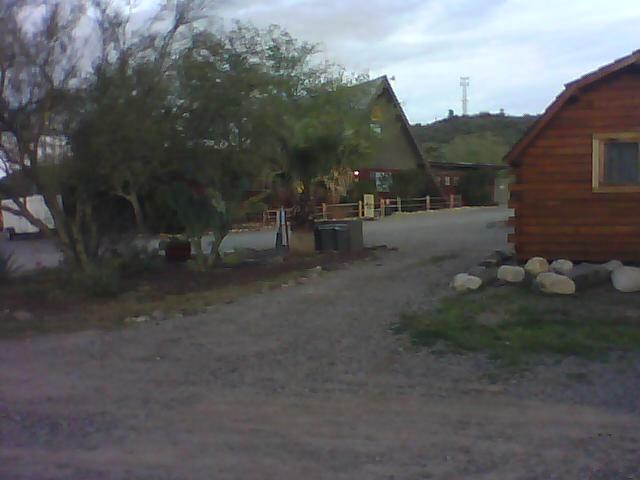 However, I did make it to my first goal, a KOA campground 45 miles north of the city. Remarkably, 45 miles was the farthest I had ever ridden in one day, and I did it on a fully loaded mountain bike. Naturally, I was exhausted; but I was also proud. Pitching my tent and securing all I had with me inside, I headed for a much-needed shower, and found Nirvana. What a great feeling that shower was. My tired old body was rejuvenated for a while, actually making it difficult to fall asleep that first night. Of course, thoughts of the trip ahead of me, of the many miles and many climbs to come, also kept me awake as well. Finally though, exhaustion overtook me and I slept surprisingly well. That first night’s stay at the KOA also began a series of surprising and rewarding experiences in which I was treated to the kindness of strangers during my adventure. Many people were eager to help me, in whatever way they could, and I am still grateful, to this day, for the encouragement and generosity I experienced from folks I had never before met and will likely never see again. I will share more of these experiences later. Thus I began the greatest challenge and adventure I had ever set for myself. It was not the most auspicious beginning I might have hoped for but, I was on my way, head up, legs churning, willfully grinding my way toward home. What a crazy thing to do. The following are links to the first two audio posts from Day 1 of The Ride. 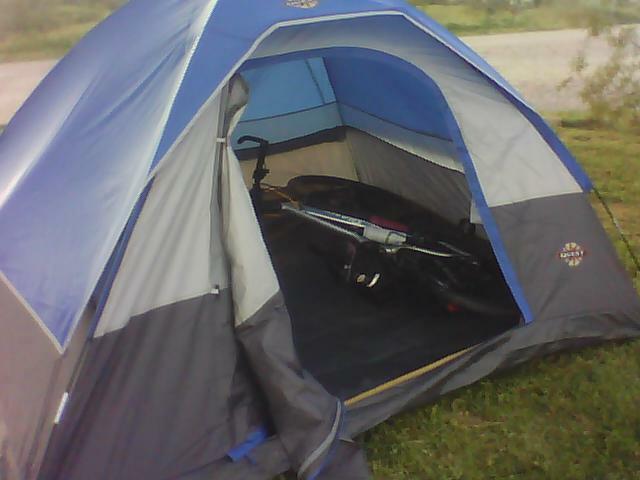 Everything I carried, including my bike, fit inside the tent with me. While I do not plan to re-post every day of the ride, I think I will post my most vivid and cherished memories from the experience. Even after a year, the memories I hold can be almost overwhelming. I hope you enjoy reliving some of them with me. I was on the cusp of my Great Adventure one year ago today. Being so close to The Ride, I became a bit introspective and tried to explain why I was accepting this challenge. My thoughts from then seem to explain it pretty well. Oh and, mixed in with some pain and a lot of exhaustion, I did rediscover joy and freedom over those two weeks. Tomorrow is the big day. I’ll do the final walk-through on the house, and then…I’ll hit the road.. Unfortunately, I probably won’t be able to get on the road before 9 am. I’d prefer an earlier start but the office doesn’t open until 8:30, so I’m sure that will not be possible. The plan for today is to work hard on final tuning and set-up of the bike, then move everything into storage this afternoon. Tonight will be my last camp-out inside. However, through it all, the one thing I’ve always been able to count on was my bike. No matter my mood, no matter my situation, a ride would nearly always brighten my day. What great therapy it is. No matter how badly my day might begin; despite frustration or depression; an hour–or two–or three, on my bike, would surely improve my mood. How quickly, with age, we forget the sweet and simple joy of physical exertion we experienced in our youth. Do you remember, as I have recently begun to, the absolute joy you felt as a child when your mom finally allowed you to go running from the house to jump on your bike and speed down the street to ride with a friend or two? How sweet the memory; how sweet to feel that joy again–at 54 years old. The simple pleasure of physical exertion, the concentration and focus of such a simple task–of turning the crank and rolling down the road– to whatever location, task, or destination I have set for myself that day–ah, what a perfect moment. FREEDOM, that is what I feel; and so, freedom is what I seek on this ride. The freedom to challenge myself. The freedom to explore. The freedom to do something I could never have imagined myself trying two short years ago. The freedom to succeed at a task which I, and I alone, can do. Joy and freedom, two emotions which have been sorely lacking in my life for some time now, are the reasons for this ride. If I succeed, I’ll know both. Should I fail, I’m sure I’ll have glimpsed them both again and will know, even in failure, that both of these things, joy and freedom, are still available to me. The countdown continued a year ago today. I was working hard to get everything done and really wasn’t riding much at all. This was probably a good thing however, even so, my legs were not really getting much rest. You can’t believe how busy I was at the time. I remember this much, all I wanted to do was finish the work and hit the road. Riding a bike 800 miles simply had to be easier than moving house. I’m nearly packed for the move now. I’ve done a much neater job than usual. There are cartons and boxes all over the place. Knowing that I had to pack for the future drive to Denver meant that I had to take more care. Many times in the past, when I was merely packing for a move across town for instance, I would just throw a bunch of junk into a box for ease of carrying, not worrying about transport. This time, I had to bear in mind that my stuff would be in a dusty storage unit for months before I would load it into a truck for the eventual drive to Colorado. This has forced me to be much more organized and careful. This is a good thing, right? Packing for the ride is also pretty much settled. I’m a bit worried that I am taking a little too much stuff. My riding clothes are lightweight and easy to pack but, even so, I’ve probably planned on too many pieces. All I really need is one outfit in my bags and one on my body. Trying to pack for all possible contingencies, such as weather and remote locations where it might be difficult to clean things, has forced me to choose more clothing than I might otherwise do. I’m going to play with the packing and unpacking a bit today and make a final decision. I really don’t want to get on the road and feel like I didn’t bring enough, yet I also don’t want to carry anything I don’t really need. Taking a break from cleaning and tuning a bike, so I thought I’d drop a note. You know what? Being a bike janitor is kinda’ hard work. It’s also dirty work. But hey, what else am I gonna’ do? A year ago today I was still packing for the move to Colorado, as well as working up to The Ride. I was also trying to figure out how to do this blog thing. Here are a couple of posts from this time last year, just to remind us of what it was like. Today will be a very busy day. My roommate has moved up his day of departure. Instead of leaving tomorrow morning, he’ll be heading out this evening. In a way, this is a good thing; it will allow me an extra day to concentrate solely on the things I need to get done. On the other hand, I’m using his computer (mine died a couple of years ago), so my posting-by-phone will begin a day sooner. Well, I guess that means more practice for phone posting when I’m on the road, eh? The worst part of packing for the move begins today as well. I’ll be wrapping and packing dishes, pots, and pans. Luckily, Steve bought some clean newsprint for packing and has left me quite a bit, so wrapping breakables will not be as dirty as it usually is with regular newspaper. I sure do hope I have enough boxes for everything. Also need to do a last load of laundry, since we sold the washer/dryer and they will be picking those up today. This means I’ll begin “camping out” in the sleeping bag tonight, I guess. FYI: Since the computer will be gone soon, I’ll be doing “future posts” today. WordPress allows me to write a post and set a future date for posting so, if I can figure out how to use this feature, my posts for the next day or two will probably be done that way. I will probably do a couple of audio posts as well, via ipadio, to add updates each day, as well. OK, time to get to work. Had a very productive day today. Got very close to finishing packing. Tonite I sleep on the floor. Well, THAT didn’t work like I planned it, did it? I’d thought I’d have a good job almost immediately upon my return to Denver, which would allow me to get my act together in just a few months. As it turned out, it took a couple of months to get a job at all, and that job kind of sucked. So, I’m now doing my own thing, or things, to survive. Do I hate the idea of moving again so much that I’ve sabotaged myself? Nah, I just haven’t found the right opportunity. The freelance writing is bringing in a little cash and, while the work for Andi is rewarding, it is also intermittent. But, the bike biz is going well. Besides selling a hybrid and a single speed bike I rebuilt last week, I’ve also worked on two bikes over the last two days, with another waiting for service. That will make four tune-ups in about ten days. Hell, I may just keep doing this. Why work for someone else when I can work for myself? What do I write about today? How about the worst part of this entire process–the move? God, I hate moving house. I think I’d rather ride my bike 800 miles instead. In the highest gear I can find!!! Uphill all the way!!! Into the wind!!!!! Well, as I’ve explained before, most of my belongings will be going into storage for a while, since I can’t haul furniture on my bike. The plan is to work for a few months and save, save, save; until I’ve saved enough to return to Phoenix, rent a truck, and drive my stuff to my own place in Denver. I figure 3-4 months before I have the cash to do this, as well as a bit in reserve to live on. So, the packing continues. It would be much easier if I were merely putting it all into storage for a while. (I’ve done this so many times in the last few years it’s automatic for me.) However, this time I need to pack it all for the future move as well. This means I need to think ahead on so many levels: how large a truck do I want to rent eventually; how large a place to get for myself the next time; where exactly will I want to live in the future, etc., etc., etc.? It seems like an awful lot to ponder even as The Ride looms before me. But hey, I guess this is what being a grown-up is all about, right? Holy crap, when did I become a grown-up? One year ago today, with five days to go, I began the final countdown to The Ride. I was so very busy at the time that I really couldn’t think much about what a crazy idea it was. In retrospect, it does seem a bit outrageous. However, I was so eager to get started, so eager to return home, that thoughts of the dangers rarely intruded on my thinking. It was a very exciting time for me and, though not everything went according to plan, I’m just happy I was successful. Was I really planning on ridng this all the way to Colorado? Today, I will do more packing for storage. The biggest dilemma is always what not to take. I need to consolidate as much as possible, yet I do not want to force myself into a position of need, where I will have to buy anything just to live normally. When I finally get my own place again, I want to be completely self-sufficient. I’m really looking forward to this experience. Many friends have told me how much they envy me; while also telling me they’re frightened for me. Only when I’m alone in bed late at night do I feel any fear. However, that quickly disappears when I wake in the morning and begin to contemplate my upcoming adventure anew. Since I have never done this type of traveling before, I do feel some trepidation but, with all the research I’ve done, and with nearly a year of thought and planning, I believe I have a pretty good idea of what to expect. (If I’m wrong, I’ll know soon enough.) Besides, I’ve done a great deal of traveling through the Rocky Mountain west and the southwest over the years, by car it’s true, which helps me to feel quite comfortable traveling here. Besides getting ready to move house, one year ago I was also getting ready for The Ride, working on my gear and the bike. Been working on a lot of bikes lately, again. Here are a couple of posts about my preparations at that time. Kewl!!! 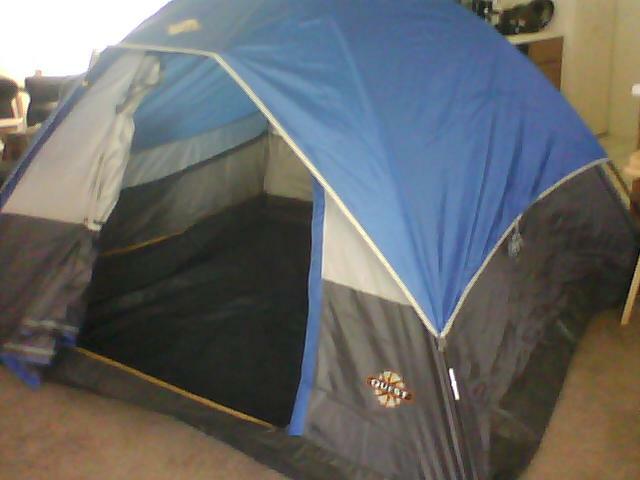 Got the tent today. Set it up in the dining room. Gotta practice set-up in case I need it in a hurry. More importantly–I’ll need to practice knocking it down and packing it, to make sure I can get it back into the carry bag!!! It’s very roomy inside. I’m going to play around and see if I can get my bike inside too. It will be safer at night if I can. Plus, if I run into bad weather, I’ll want to keep it inside. 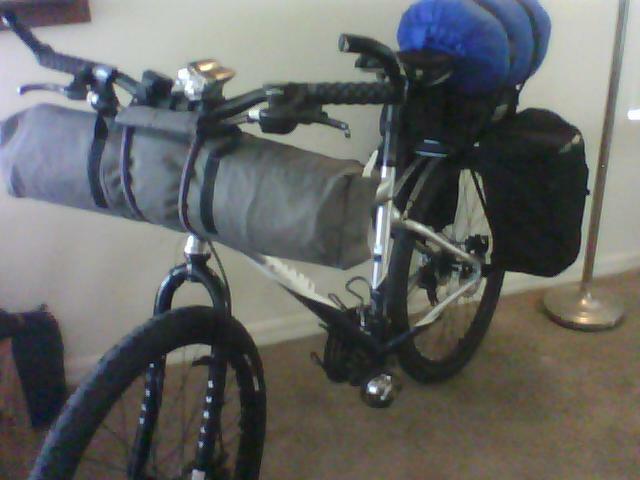 The stem riser came today so I was able to raise my handlebar and figure out how to hang the tent; that is the grey thing hanging below the handlebar. At the rear I have my sleeping bag (blue), with a trunk bag full of miscellaneous items beneath that, strapped to the rack. Hanging from each side of the rack are my panniers (wish they were larger), in which I will carry all of my clothing. Pretty compact for a possible three weeks of travel, eh?